I love to do this Coast Range peak in the early days of summer. It is a challenging drive, and a moderate hike. Snow is usually still lingering about the summit area, depending on the snow year. This is a long day from town. This year, I took three others to fill up my wagon for the four hour drive to the trailhead. Usually having a quick bite plus coffee in the town of Stonyford, we stopped at the USFS ranger station to pick up a permit. The route goes up a long, paved, and curvy road. It then turns to dirt after several miles. The drive here alone is awe-inspiring for the vistas that are afforded just driving 4,000 feet above the Valley floor. It takes a skilled driver to negotiate the narrow and steep dirt road. The rangers often suggest 4WD only, but with a little care, one can make it in a higher clearance passenger vehicle. One year, there was a narrow part, which, if collapsed, could send the carload crashing down an abyss. My passengers say, "We'll enjoy the scenery, you keep your eyes on the road." A short, final, steep section of dirt road brings us to the signed trailhead. The trail starts off on a south-facing chaparral slope. In later years, a fire gutted this area. I hadn't been back after that. The three followed me peaceably, and with anticipation and enjoyment of being in this little-known and rarely-visited area. One year, the ranger said that we were the only visitors. I had almost never seen anyone else on this trail. Running into a snowbank high up, we headed straight for the summit. The higher point is on the east. A columnar stone structure marks this top. A metal register box is bolted into the rock on the far side of the highest rocky outcrop. Pretty much, the Sierra Club doesn't go here. The views extend up to Mt. 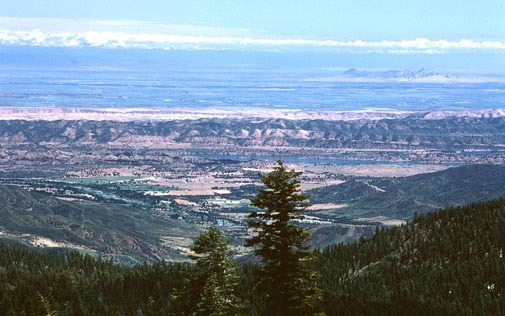 Shasta to the north, and the Lassen area to the northeast. It is always nice to see these two other peaks, which, having had climbed them both leading groups, is like seeing old friends. Sutter Buttes is also visible, seen to the right in the photo. We walked over a half mile to bag the western summit. I don't count these as two peaks, although some would. Snow Mountain is the high point of Lake County. It counts now as a listed peak on the NAS list used at the time, but the hikers today didn't care. They wouldn't be climbing the more challenging peaks, anyway. This is now the Snow Mountain Wilderness, established in 1984 by the California Wilderness Act. I am glad that this area made it. The large timbers about the summit area are the last remnants of ancient forest that will be saved from the heavy logging that goes about in the Mendocino National Forest. Hiking back down, the weather began to deteriorate. It is amazing that the Central Valley below may have hot sun, with 90 or 100 degree highs, while hikers are freezing cold on this mountain. I remember that we received big drops of rain on one descent. The other hikers couldn't imagine to bring raingear, not having the extensive experience that I have. Many people take such urgings as a joke. Sometimes, it can be deadly serious. Two pine trees form a sort of gate about the trail. I took a picture of one hiker passing through. It's fun to note such natural features. Someday, this spot may be revered. Back to the car by late afternoon, it was our custom to drive back to Interstate 5, and have dinner in Maxwell or Williams. There was a Basque restaurant in Maxwell that I wished to try. They served a large meat dish, with the usual sides. A psychotic hiker threatened to "kill" me as I set the requested, gas sharing amount as a generous $4 (maybe 300 miles round trip) apiece. He is ex-military, by him, and has a sick, violent streak. The local chapter Singles group currently welcomes him as leader and mentor hiker. So much for that group! We drove back into town in the cooler evening. Most local hikers wouldn't believe where we were today. My frequent phone calls about how I was just back from a normally improbable location are met with silence. What a lie, they must think. It was, indeed, glorious!